The report examines the number and quality of news coverage of water and agricultural issues and the high temperature associated with the drought crisis by reviewing the nature of the media coverage that the media focused on in this regard. The report includes monitoring of more than 30 media channels, including television channels, agencies, news sites and local newspapers. The report focuses on the statistics of the content of drought and global warming and its types, and how it is analyzed and compared to the overall media content. Monitoring reports show that local media coverage is not very concerned about the crisis, despite its importance and seriousness in Iraq, and its connection to political, security and economic crises related to national and food security, while coverage covers the crisis superficially with no investigative reports on the crisis. The report also notes the escalation of the risks facing the country each year due to the drought crisis. As the countries of the region and the rest of the countries began long-term strategic plans to confront the crisis, the government and the parliament did not take serious steps in this regard despite the clear and growing risks, the last one is that Tigris levels fell to dangerous levels last summer. According to official reports issued by the Ministry of Resources, Iraq lost 30% of the amount of water obtained from the Tigris and Euphrates River, and in a few years will lose 50% of its historical share, without counting the effects of climate and global warming crisis, while Iraq lost 50% Of its arable land in the summer agricultural plan last year. 1- The percentage of news and press coverage related to drought is 1% of the political, security, and economic content of the media in an indication that the media is not interested in coverage of the drought crisis or related problems. 2- By monitoring the official government websites found that the legislative and executive authorities do not have serious plans to deal with the drought crisis, and only publish statistics and figures that are mostly public and do not affect the substance of the problem. 3- The media are limited to the official statements and statements issued by the ministries and institutions related to the drought crisis. These data were published without analysis and follow-up, while the exclusive coverage of the crisis was absent either through televised reports or through press reports. 4- The media ignore the use of experts in the drought crisis and related problems such as agriculture, industry, trade and economy, and focus only on officials, whose statements about the crisis are often the country's general information and avoid talking about present and future problems. 5- Limited journalists experience in covering the drought crisis, lack of backgrounds, statistics and figures on the crisis and its association with the drought crisis and global warming.Journalists often provide academic figures on water quantities, agricultural production volumes and high temperatures without understanding their reality and effects. 6- The Iraqi media are using Arab and foreign press coverage as a major source of coverage of the drought crisis and its problems in Iraq. The foreign media have put the drought crisis and the decline of the water levels in Iraq at great importance over the past years and their relation to the political and security conflicts and risks facing national economic and food security. 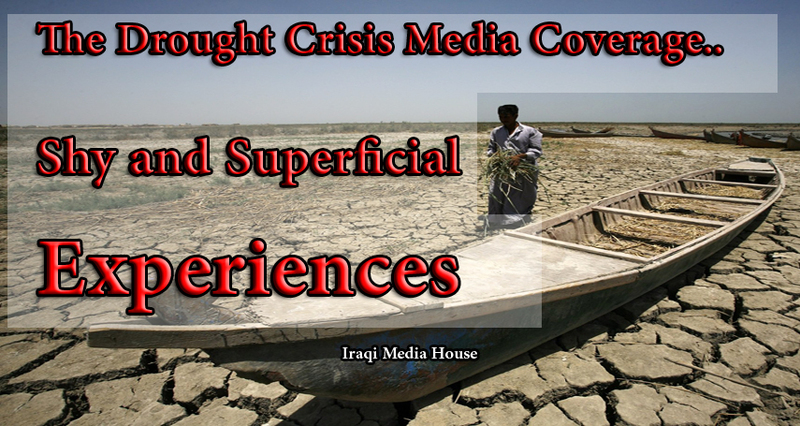 7- The media coverage of the drought crisis for political purposes linked to the conflict between the blocks and political parties, especially between the provinces and cities of Iraq, especially in the south of the country, which is most affected by the crisis, as happened in the province of Basra last summer 2018. 1- The media institutions should give the drought crisis, environmental issues and global warming importance in their production of expertise and not only to review the official figures. The media should train some of their cadres on drought-related coverage through training workshops and pamphlets published on Arab and foreign websites containing useful information on ways to cover this type of crisis, noting that the drought crisis is no less important than the crises of politics and security. 2- Journalists and media professionals should increase their personal experience in the coverage of the drought crisis by looking at studies and reports published in this regard, and using experts and university professors on the crisis and not fearing specialization in this field, which suffers from the absence of specialized journalists and the allocation of part of their experience of drought and associated problems . 3- Local and international organizations involved in supporting and training journalists should prepare programs and workshops on drought, environment, agriculture and global warming, and encourage journalists to write reports and surveys and help them disseminate them to relevant foreign sites on the crisis.